About 2 years back, I used to be a frequent visitor to beauty salon for facial treatment.. I will go beauty salon at least once a month for facial to cleanse and moisturize my skin. Unfortunately, for all the previous experiences I didn’t see any improvements & differences in my skin conditions. I decided to stop spending money on facials and DIY my own facial treatment at home. Earlier of the month, I was invited to The Spa-Lon to experience their signature ATP-38 series treatment. After seeing a few reviews from various bloggers, I decided to give it a try and guess what? I’ve made the right choice! After 2 years didn’t step into beauty salon for facial, I’m really excited and looking forward to it. I visited The Spa-Lon at Tiong Bahru Plaza branch, it is located at Level 5, #05-08. Reception area is spacious where you can have a seat, enjoy the relaxing ambiance while waiting for the staff to serve you. The lady at the counter is Irene, the Branch Manager. She will be the one taking care of my face later. 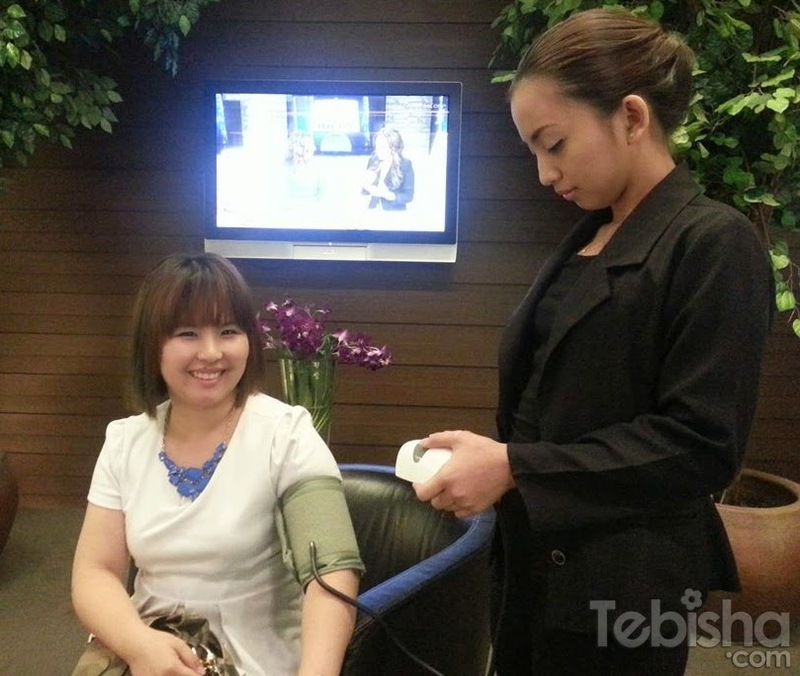 Before bringing you for the treatment, the staff will assist you in taking your blood pressure. This is my first time visiting a beauty salon that took my blood pressure. Thumbs up! They also have consultation room, new customers will bring into the consultation room. Beautician will gives you a detailed analysis on your skin and suggest which treatment suits you better. The Spa-Lon Tiong Bahru Plaza branch has a huge & lovely changing area. The changing cubicle with large mirror and great lighting which gives you a very relaxing feel makes me change very slowly, couldn’t bear to leave the place.. They are really thoughtful that hair dyer and combs provided for you to re-arrange your hair after treatment. No messy hair after treatment! Picture in the lovely changing room is a must! Thanks Mag for taking such a great shot! After changing, I was brought to the treatment room. 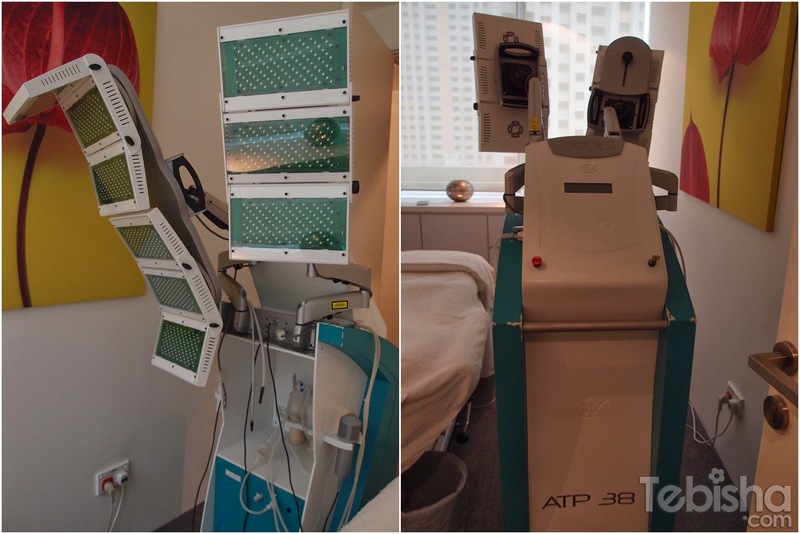 This is the amazing ATP-38 machine, Irene going to use this on my face later. Can’t wait to experience it! I came with my make up on, so the beautician helped me to remove all my make up first before starting the treatment. My face after cleansed, very dull and uneven tone skin. Irene examined my face and spot on my skin problem straight away! Dehydrated skin, she also amazingly found out my eating habits from my skin condition. In this ATP-38 series I get to experience 5 different types of treatment. 1. Micropeeling Treatment S$690.00 (4mins): Using the finest coridon sand with this micro-dermabrasion treatment, the skin is cleansed, dead skin cells are exfoliated and fine lines removed with minimal discomfort. Pigmentation and dark spots are also reduced. And this the micropeeling device she going to use it on my face. Review: Some of the them may think it is a painful process while removing the dead skin from your face. For me, I feel that the pain is bearable. Maybe my pain tolerance level is high. First round, you may feel a little discomfort but after going the second and third round you will feel less painful and surely no uncomfortable feeling. From the below picture, you can clearly see that after the treatment my pores are obviously minimize and cleaner skin without dead skin. 2. Photo Rejuvenation Treatment S$249.00 (12mins): Discovered by NASA, this treatment utilises different kinds of light in order to re-energise, restructure andrevitalise skin cells. This results in increased collagen production and regulates melanin giving you a more radiant skin. Before trying out this treatment, I felt a little worried of the light may be too strong and hurt my eyes. So i asked Mag for the experience, she told me I don’t have to worry at all, the light is completely safe for my eyes, you can even open your eyes while doing the treatment. After hearing this from Mag, I felt less troubled and decided to give it a shot! Irene also ensured me this process going to be really safe, even for people wearing contact lenses like me. She told me to close my eyes first, slowly open and close it for a few times until my eyes get used to the light. Review: The light is truly safe to our skin and eyes, no warm nor stinging feeling throughout the 12 mins. I feel completely comfy and even fall asleep during treatment. 3. Radio Frequency Treatment S$890.00 (30mins): Electromagnetic waves permeate into the deep layers of the skin, restructuring it from within. This treatment provides an immediate tensor and lifting effect to the skin, and a filler effect to wrinkles, combating all signs of aging! Unlike other Radio Frequency Treatments, this is 100% un-invasive and pain-free! Review: During this process, Irene asked me that am I a person that don’t perspire easily? OMG! How does she knows that? While doing the treatment for me, Irene can tell my eating habits and health conditions through my skin. She so knowledgeable and I’m so amazed by her. She advised me not to have too much meat, my dull skin actually caused by too much intake of meat than veggies and fruits. She also mentioned to me not to sleep side way, my right and left face seems unbalance due to the position i sleep. Best position is to sleep face up, so that your left and right face won’t be unbalance. For this treatment, she focus more rounds on my right face cause I tend to sleep on my right side. She’s trying to balance up both sides of my face. Very smooth process, no discomfort feeling at all. 4. Cryocooling Treatment S$439.00 (10mins): Eye-bags and dark circles are visibly reduced and the surface of the eye contour is smoothened. This is because the eye contour is subjected to a soothing, low temperature handpiece. Review: Very cooling and relaxing treatment. I actually closed my eyes throughout the whole process to enjoy the gently calming effects. It helps to calm my mind and relieve the tiredness of my eyes. Dark circles are visibly reduced. 5. Eye-lifting Treatment S$490.00 (10mins): Electromagnetic waves are used to “lift” the eye contour, smoothening expression lines and crow’s feet. Review: This the the last treatment and I really love it. The electromagnetic waves is definitely safe for all. It will smoothen the the lines on your face and lift up the eyes area. Thank you Irene for taking care of my skin with the ATP-38 series treatment. She gave me a lot of useful advises and tips on taking care of my skin and health. Been to quite a few beauty salons for facials, I would say The Spa-Lon ATP-38 treatment is one of the best facial treatment I’ve tried. They do not have the process of extraction which I hate the most during all my previous facial experiences. In my own opinion, Extractions is a very painful process for me, its actually hurts my pores and damage the skin while the beautician trying to squeeze out black heads and pimples. ATP-38 series Micropeeling Treatment is a better option than extractions. Thanks Mag for all the arrangement, greatly appreciated. The Spa-Lon is having promotion now! *Prices subject to 7% GST; customers will be charged accordingly.